Lest all of you think that I skipped out of town with my extra copy of the Thinkfood cookbook, I think it is high time I announced the winner. Thank you all for the beautiful stories you shared in the comments section on the last post. I love hearing about other people's food memories. I used a random number generator to select a number between 1 and 25 (I know this is a cop out, but there were just too many good stories and I was having a really hard time choosing just one). The web site selected number seven, so, Saint Tigerlily, you are the winner! I will get in touch with you to arrange delivery of the cookbook. In the meantime, as fall is most certainly upon us here in New York City, I think it is time to get down to some apple business. My friend Tanitra, FCI classmate and fellow food blogger, brought me a bag of apples from her recent apple picking outing to Mead Orchards. They are delicious, juicy and just the right balance of sweet and tart. I am using some of them this afternoon to make the Apple Vinaigrette from Phil and Lauren Rubin's new book, The Comfort of Apples. I will be sure and share that vinaigrette and the resulting salad with you shortly, but first I want to get to the apple tart that we are now making nightly in level 3 at The French Culinary Institute. Get all ideas of apple pie out of your head before you make this tart. There is not a lot of sugar in this filling. If you are looking for a sweet, syrupy interior, stick with your favorite apple pie recipe. However, if you love recipes that let the natural flavor of ingredients shine, definitely give this a go. The tartness of the apples really comes through in the final product. Roll out your dough and fit it to an 8" tart shell and place it back in the fridge to rest. If you have just made your tart dough, be sure and let it rest in the refrigerator for an hour before rolling it out. Peel the granny smith apples and roughly chop them. Add them to a saucepan with two tablespoons of water and 4 tablespoons of sugar. Loosely cover and cook until the apples start to break down. You want the mixture to be approaching applesauce consistency, but with some remaining apples chunks. Set aside to cool. Peel and core the golden delicious apples. Cut them in half vertically. Cut each half into very thin slices, no more than 1/8". These slices will be used to decorate the top of the tart. If you are not decorating the tart right away, toss the slices with a little lemon juice to prevent browning. Remove the tart shell from the refrigerator and fill it with the cooled apple filling. The filling should come about 3/4 of the way up the tart shell. Arrange the thin apple slices in two concentric circles. No filling should show through the topping. Place in the preheated oven for 10 minutes. Reduce the heat to 350° and continue cooking for an additional 50 minutes. Combine the apricot jam and two tablespoons of water in a small pan. Heat gently to thin out the jam. Use a pastry brush to glaze the tart with the jam. Let the tart cool to room temperature before serving. This tart could not look more perfect! Wish I was enjoying a big slice of it right now. You can never have too many apple recipes in the fall and winter. This one looks great, and so simple, too. Thanks! Wow... your tarte is gorgeous and definitely looks 'professional'. I have tons of apples and this looks like the perfect dessert to make with them. WHAT! YAY! I am so incredibly excited! I went through my whole life never winning anything but I seem to be loved by the random number generating gods because I have one THREE cookbooks in the past five years. NO WHAMMIES! Of course now that I've said that I will never win anything ever again. Ever. But I don't care! This looks so good! im going to try to make it and give my feed back how it was. Oooh la la! Looks perfect. Autumn in New York is a beauty- right? 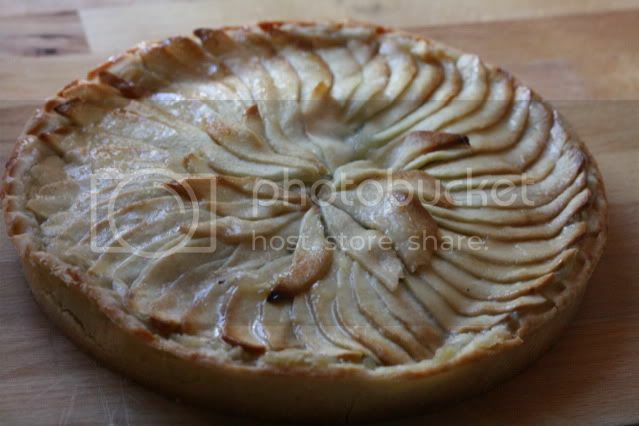 Beautiful, classic Tarte Aux Pommes. I'd happily make this nightly. But I'll just settle for one tart to enjoy this weekend. Thanks for the inspiration. Where does the 4T of butter come in? I assume it's to cook the granny smiths down. Right? Your tart looks utterly perfect - what a classic. And, delicious of course! j love apples cakes.they remind me my mother.good recipe! this looks so amazing! I'm definitely going to try it out. Thanks for sharing. Check out my blog http://thoughtsbyrozi.tumblr.com/. It's a lifestyle blog, and every once in a while I feature some of my recipes bit.ly/gzljBT... love the veal stock recipe too. This looks lovely. Do you know how long it will keep in the refrigerator?